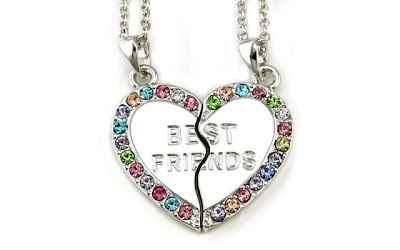 This Best Friends Forever BFF Multicolor Engraved Heart Pendant Necklaces is currently selling for just $10.99 on Amazon.com! You will be saving 45% off the listed price of $19.99 with this jewelry deal. What I like about this pair of BFF necklaces is the multicolor stones. They colors are happy ones, making this a perfect Valentine's Day gift for tween and teenage best friends, sisters, or cousins.